If you follow my beauty reviews, you will know by now that I'm always on the look out for great body creams and lotions that really nourish dry skin and preferably last all day long. I've trialled some wonderful products over the years (I was particularly pleased with Eve of St. Agnes Hydrating Body Cream and Bronnley's Citrus Collection), but most of these were thick, rich creams that required a little effort to apply as they (understandably) didn't absorb as soon as they touched my skin. I've mostly steered clear from thinner lotions because while they can be efficient for people who just want to give their skin a moisturising boost, it wouldn't actually work for a very dry skin such as mine and more often than not they are quite runny too and so rushed application before work in the morning would result is a bit of a mess as well. So when I was offered to trial the Rapid Moisture Spray Lotion, I was instantly intrigued by the 'spray' part of the product's name. I didn't think that the lotion would work wonders as a moisturiser, but I was keen to try how this different form of application would work for me. So what was my experience of using the Rapid Moisture Spray Lotion? The first thing I noticed when I received the product in the post was that it doesn't come in a particularly appealing package. The metal can looks and feels similar to that of a can of hairspray or shaving foam, rather than the delicately designed pots and jars I've come to love from the more luxurious body creams I regularly use. As it requires a spray function this was never going to be an eqsuisitaly shaped jar of cream though to be more eye-catching on the shelves perhaps the design on the outside could've been more delicate and colourful. 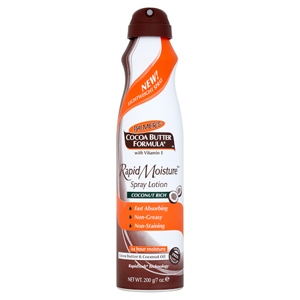 Yes, the brown swirls reflect the cocoa and coconut shell that give the lotion its tropical fragrance, but solid browns simply aren't very appealing on the packaging of a skincare product - and it's the outside, not the effective product hidden within, that gives potential users a first impression. But, just like you shouldn't judge a book by its cover (which, admittedly, I totally do) in this instance you shouldn't judge the skincare product by its packaging either - as it's the lotion within that counts and that worked very effectively indeed. Holding down the nuzzle a perfectly-sized amount of the product was evenly distributed over my legs. As expected it was quite runny, but because it was such a small amount that was released there was plenty of time for me to spread it out and let it absorb without creating any mess. And while doing so the strong scent of coconut and cocoa punched the air, instantly transporting me to a much more tropical location. The fragrance was quite strong and lingered for a while, perfect to get you in the summer mood - or to pretend you're wandering a candy shop in Disneyland. And despite being on the thin side compared to the more rich body butters I use, it moisturises very well and lasts for ages. Most of all though, this product stands out because it is incredibly easy and convenient to use. The spray works very well and is perfect for rushed mornings, so I will no longer occassionally skip my morning moisturising routine in favour of catching my train. Plus I smell like the tropics straight after use too, win/win!